Gas station owners say that record high gas prices mean that a higher number of customers are driving off without paying for their gas. They say it's not uncommon to see the number of drive-offs rise when the price of gas rises, and the steady jumps in fuel prices have made this a grim reality for many gas station owners. It's predicted that gas will easily be at $4 per gallon in many areas of the country soon, so concerns about drive-offs are growing. It's especially troublesome because gas station owners make very little money off gas to begin with. 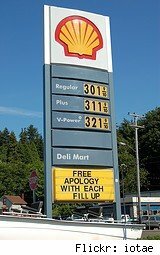 They can't afford to lose gas to dishonest customers. I just don't understand the mentality of those who steal anything. I can't imagine feeling justified in stealing gas from a gas station. That business is owned by someone who is trying to make a living just like everyone else. The price of gas is mostly out of their control, and the gas station owners don't deserve to get punished just because they happen to be in an industry that is currently squeezing consumers due to market conditions. If this trend of driving off without paying for gas continues, the solution will be simple, although inconvenient for customers. Gas stations will simply require everyone to pay before they're allowed to pump their gas. How sad that they may have to resort to this, but it seems to be the most logical way to curb the losses from fuel thieves.